I am often quite cautious and avoiding of small independent perfume setups. I am wary because in my experience I have encountered far too many lacklustre and utterly erroneous perfumes that I begin to feel a higher duty to warn people of their danger. But, Fleurage tells a different story. A story of discrete luxury and personality. In the case of an ‘indie’ perfumer, work is often very close to the heart and if I don’t like something I’ll often have to gloss over it to avoid offence. I don’t think this is the case for Fleurage perfumes. There is a big golden heart present inside every perfume and when I met Emma and Rob of Fleurage the ultimate luxury they offered me was freedom. The perfumes Emma had carefully constructed spoke romantic tales, offering more than words ever could. Something of particularly meritorious mention is the quality of the scents. Fleurage for me has single handedly blurred the dividing lines of quality between the big houses and the little guys (with big hearts and big intentions). The quality of the scents, whether it’s a perfume or cologne, is so unashamedly high it can rival the big houses. So, bravo. 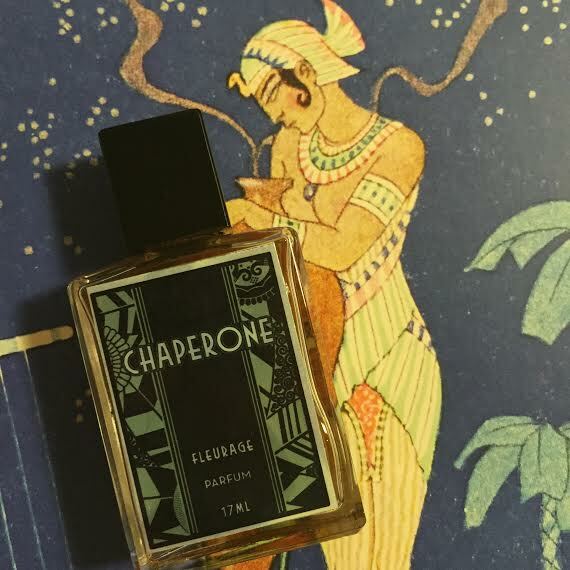 With great pleasure, I introduce ‘indie’ perfuming house number two: Fleurage, with their amber scent ‘Chaperone’. Writing about amber and amber-centric perfumes is a bit like tasting wine and jotting down the ‘notes’ found from both the nose and the palette. There are blended wines, and this analogy can be extended to ideas and concepts in perfumery: especially accords. There is much pleasure to be had developing impressions of aspects that are otherwise an augmentation of reality in the sensuous realm. What I mean is, when sipping a full-bodied red wine after reading the suspected tasting notes, is that really what you’re tasting, or is it what you have been told that you are tasting? In perfume, when I say I smell a note faintly resembling black pepper, and whether or not it is present in some manner or another, be it naturally extracted or a synthetic aromachemical, what is undeniable is that I am smelling an impression of pepper. And so, the beauty of an amber-centric perfume can be equated to the fine art of oenology. In my experience with amber, it’s all about the central accord being slowly dissected in chunks and the impressions being explored in a manner that allows for the nose to explore. I think then, my constant reference back to Serge Luten’s Ambre Sultan (possibly the world’s most famous and one of the best ambers) is something that will remain that way for a while, and is still left unreviewed due to me not being able to say much. Ambre is amber, and, ambre is beautifully amber for being exactly that. It’s a scent that bypasses the critical faculties and goes straight into the receptors for love and pleasure. At the start, Chaperone presents a spicy pepper and clove note, underscored with ginger and something narcotically boozy and sweet. For me, the opening moments shift almost erratically in the most beautiful way, as its citrus veil begins to depart in the far background and a salty note projects vertically from a mild distance. The strong presence of anise resembles the culinary scent of fennel seeds as an indirect reminder of a cutting freshness and counterpoint against the lavish oriental notes. As a consequence of this top structure, ‘moody’ is best to describe the scent as what I find is a series of magnificent top notes being pulled and alloyed into the warm amber accord heart. My particular penchant for ‘digging deeper’ finds a classical oriental-styled base structure. Thus, notes like patchouli, benzoin, and animalics is something I find purring in the close background. Benzoin is synonymous with amber oriental perfumes, especially as it is a major contributor to amber accords. In this context, it gives a purifying tinge that is at times clinical, but also something liturgically purging from its incense-like facet. I also think the gum resin here diffuses something suppressed and sweet – perhaps like a rich delicious vanilla or tonka bean inflection. To round and yet paradoxically bolster the stickiness, patchouli adds the shading to this artwork, a sultry earthiness that displaces powder for a sumptuous musk. There is a tendency for this perfume to always pull back into a range that is undeniably intoxicating. Sultry and tender at the same time, this amber is something of a hidden gem. Delicious yet overloadingly oriental. One of the best ambers I have ever smelled. When you wear this you will need a chaperone. Thank you for the experience Emma & Rob. This entry was posted in Fleurage and tagged Amber, ambre, chaperone, extrait, fleurage, Fragrance, Indie, Melbourne, nose, parfum, Perfume, perfumer, Perfumery, scent. Bookmark the permalink.